Last week NASA revealed the first image from the new LDCM sensor, and it looks spectacular! 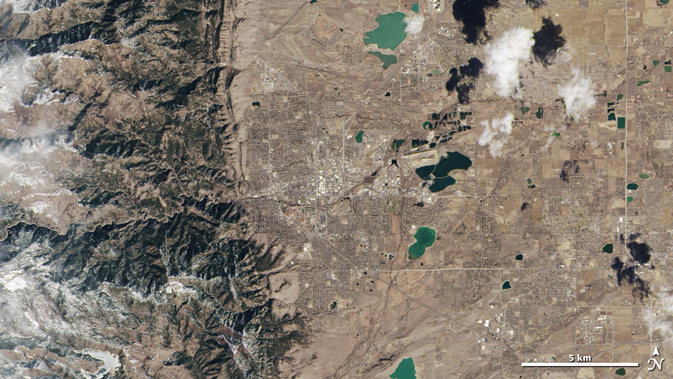 The image includes our home in the Front Range of the Rocky Mountains, which also happens to be the home of Ball Aerospace & Technologies Corporation where the OLI sensor and part of the TIRS sensor aboard LDCM were built. The image was collected at 1:40 p.m. EDT on March 18. The level of detail in these new images is largely due to the new push broom design of both the OLI and TIRS instruments. Previous Landsat instruments employed whisk broom sensors, which scan back and forth to cover a full swath on the ground. Push broom sensors collection data across the whole width of the imaged area simultaneously, allowing a longer dwell time for each pixel. Before Landsat 8 data are ready for prime time, though, additional validation and other preparations are still necessary. Normal operations are scheduled to begin in late May, when control of the system will be transferred to the USGS. At that time, the system will be renamed Landsat 8. A true color subset of the first LDCM image collected March 18 by the OLI sensor aboard the LDCM. The image includes Boulder, Colorado and surrounding areas. Image courtesy of USGS/NASA Earth Observatory.